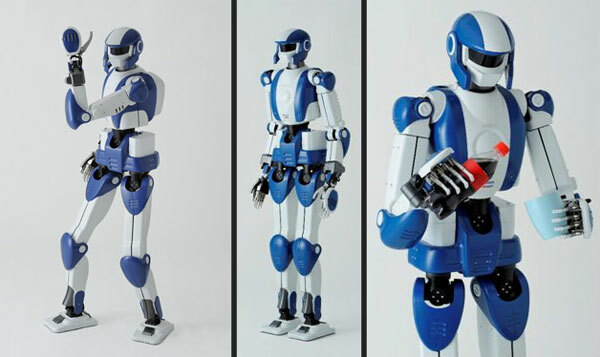 The HRP line of humanoid robots from Kawada Industries and Japan’s National Institute of Advanced Industrial Science and Technology have come a far way over the years. I became fascinated with one the HRP-3 Promet Mk-II a few years ago and while going through my feedreader recently I realised that the, the latest model of the HRP line – the HRP-4 has come a far way in a few years. The HRP-4 is definitely a massive improvement over it’s preprocessor in looks and fuctionality. In the demonstration video below the robot shows off it’s capabilities. Kawada and AIST plan to begin selling the robots to universities and research institutions in January 2011 at a starting price of 26 million yen (US$305,000) each. Japan is rapidly aging progresses, the purpose of completion of the work force as a countermeasure to the 21st century is a pressing need to realize a robot that can help in simple repetitive tasks on behalf of places to coexist with people The. Workplace people, family living, and machinery to be used because it is made to fit the capabilities and size of both, if aid agency functions of the humanoid robot life-size, the environment can be reinvested to minimize, and has also reduced the cost of the whole society. Thus, life-sized humanoid robots are expected as one of the final form of next-generation robot, the University has been developed extensively studied in recent years, including private companies and research institutions. Ah I luv japanese robots – but I especially luv the rationalisation for it all. To help the aged. I don’t know how many times I’ve heard this before. It’s so funny that the Japanese way of dealing with an ageing population is to invent a technological solution – whereas most other countries would be looking at an immigration solution. I think this says (at least on the surface) so much about Japan. And – in the end – does anyone buy this reason? I mean… I don’t see too many anime or manga about an army of aged-care-bots sweeping across the nation providing grade A support to the infirm. Not unless they were equipped with lasers and a rocket launches. Now that’s the sort of support I’d want in my later years! The Japanese government needs to wake up and realize that immigration is a viable option indeed, but I fear that will take a whole lot of doing. …. and then someone’s going to integrate Google into one of them and then when it becomes sentient humanity as we know it is DOOMED!